Dominion was first published in 2008 by Rio Grande Games and was designed by Donald X. Vaccarino. Dominion is not only one of the best deck-building games out there, but it was also the first of its kind. Sure, there were plenty of card games before Dominion hit the scene, such as Magic the Gathering, Yu-Gi-Oh, and even Pokemon CCG (collectible card game), which came before it, but the difference with Dominion is that all the cards come in one box, which means no more buying and spending a ton of money on booster packs only to get duplicates of the same card over and over. When you first open a new box of Dominion it doesn’t look that impressive. You’ll see two giant stacks of cards and a flimsy cardboard insert. Don’t let that fool you. If you’re a stickler about box organization like me then you will definitely appreciate Dominion. The cardboard insert will fit perfectly in the center of the box and every card type has its own slot for perfect organization. This may sound silly, but you’ll appreciate it when you don’t have to spend an hour sorting through pieces and cards every time you want to play. Everyone starts with an identical deck of 10 cards (7 Coppers and 3 Estates). In the center of the playing area will be a pool of cards that players will be able to buy and add to their decks. In every game, players will start with the exact same deck, but by the end, each player will have built a completely unique deck tailored to their own strategy. Building your deck can be as simple as picking cards you think sound cool, going for as much money as possible, or building the most ridiculous card combos you can think of. Someone even figured out a way to win on the very first turn by combo-ing a ridiculous amount of cards together (this is not normal and required a special setup that you’d never see in a regular game). The game has two ending conditions. The first is when three piles of the supply deck are empty, and the second is when the last Province is purchased. After that, the only cards in your deck that matter are the green victory point cards. You could have the best cards in the game in your deck, but they will mean nothing if you didn’t buy victory cards. One of the main strategies in the game involves when to buy victory cards. They go into your deck just like every other card, but they don’t do anything. They just take up space. If you start buying victory cards too early, you could end up with a bunch of useless cards in your deck during the late game. If you buy too late then there might not be enough cards left to catch up. Dominion has one of the largest libraries of expansions of any tabletop game, and they are constantly creating more. Each one has a specific theme that adds additional card types and rules. Dominion Intrigue has players following the underbelly of court life. It was originally a standalone version of the game, which comes with a set of base cards, but has since been updated to be only an expansion. Introduces orange Duration cards that have lasting effects between turns. It’s nautical-themed and reminds me of the Pirates of the Caribbean. It is one of the smaller expansions and about half the size of a normal big- box expansion. It introduces a new kind of currency:, Potions. The cards in Alchemy are all about changing one card into another. Prosperity is about big money. The cards are all about massing huge amounts of wealth, and they add plenty of expensive powerful cards to spend it on. Cornucopia is another one of the smaller expansions. It has cards that give bonuses for having a variety of card types in your deck. One of the more interesting expansions. It’s thematically based on trade between kingdoms and is filled with cards that give you bonuses whenever you purchase or gain another card type. This can lead to some very interesting combos. This is one of my favorites and is all about trashing and destroying cards. The box is full of cards that give a bonus whenever they are destroyed, which allows you to really streamline your deck. The third small box expansion is thematically based off of the medieval guild system and has the cheeky card combo: The Butcher, The Baker, and Candlestick Maker. 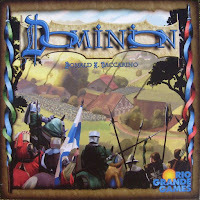 This is probably one of the best small box expansions of Dominion and offers a lot of variety. Adventures is a fan favorite and introduces card upgrades. You can watch your dinky squire upgrade to an awesome hero card with boosted abilities. It is one of the more thematically-sound expansions with a ton of new cards and rule changes. With a mighty empire comes taxes and debt. The Empires expansion introduces the debt mechanic, in which you can receive a card for cheap (or for free), but you amass a pile of debt tokens that need to be paid off before you can buy more cards. Nocturne also adds a whole new Night Phase for them to run around in. This brand new expansion just came out and gives you access to powerful artifacts and introduces coins that will allow you to save actions and money from turn to turn. Dominion is one of the best deck-builders on the market and has the prestige of being the first of its kind. It has a low cost of entry compared to many other card games, consistently has the some of the highest replayability out of my massive board game collection, and I’ve gotten a lot of non-gamers to play during family get-togethers. The creative themes of the expansions really add to the experience and make for an endless amount of combinations to play again and again. What are your thoughts on Dominion? Leave a comment below and let us know what you think. This is a guest post from Kendra and Bryan over at GameCows. They are a a traveling duo that first bonded over our love of board games. We met in Oxford, UK (literally) during a group game of Avalon. From there, we built an incredible collection of games that are fun, challenging, collaborative, and exciting. 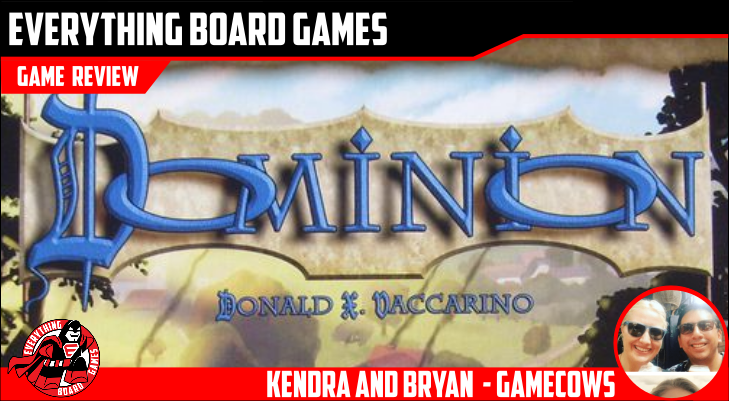 You can read their full Dominion review here, and their Dominion expansions review here.